Combatants at the Battle of Garcia Hernandez: King’s German Legion (KGL) and British cavalry against French cavalry, infantry and artillery. See the Battle of Salamanca for the orders of battle of the opposing armies and details of each side’s arms and equipment. Commanders at the Battle of Garcia Hernandez: Major General Baron Eberhardt Otto George von Bock commanded the KGL Dragoon Brigade. 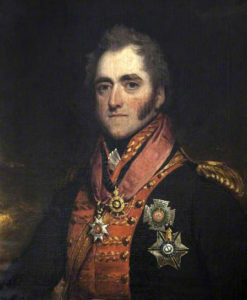 Major General George Anson commanded the British Light Dragoon Brigade. The French troops were from General Foy’s Division. 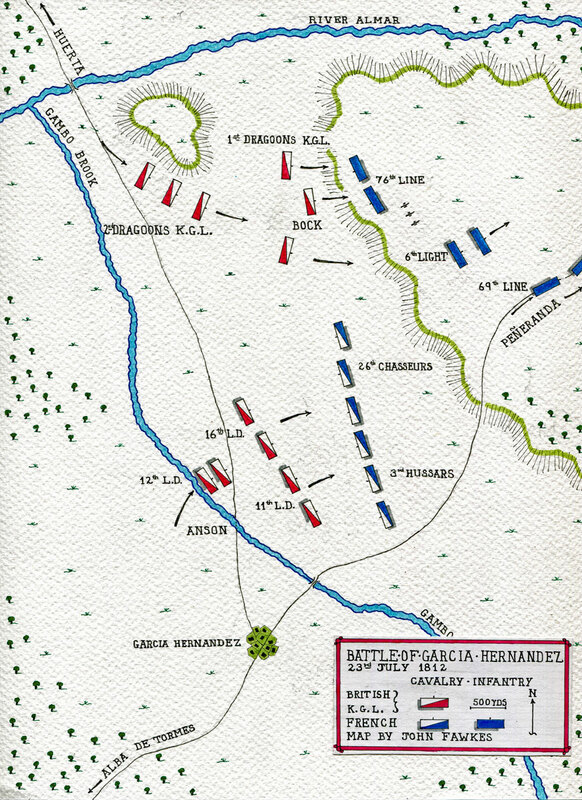 Size of the armies at the Battle of Garcia Hernandez: 2 Brigades of KGL and British cavalry against some 3 French infantry regiments, a brigade of light cavalry and a battery of horse artillery. Winner of the Battle of Garcia Hernandez: The British Light Cavalry and King’s German Legion Dragoons. At dawn on 23rd July 1812, the day after the main battle, Wellington resumed the pursuit of the beaten French army, crossing the River Tormes at Huerta with the First and Light Divisions and Bock’s Brigade of Cavalry and marching to cut the French line of retreat from Alba de Tormes, through Arevalo to Valladolid. Anson’s Brigade of British Light Cavalry, crossing the River Tormes at Alba de Tormes, followed the French army up the Valladolid road. The first main town on the road to Valladolid was Peñeranda. 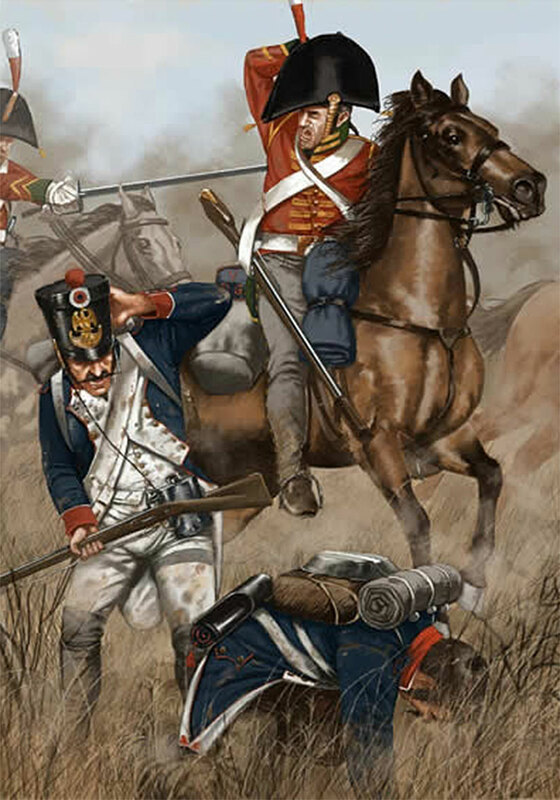 Brock’s King’s German Legion 1st and 2nd Dragoons were advancing by a difficult, stony road, when, at 2pm, they sighted French cavalry leaving the village of Garcia Hernandez, to the south of their line of march. A French horse artillery battery unlimbered at the top of a hill to the north-east of Garcia Hernandez and began firing on the approaching German dragoons. 3 French infantry battalions formed square on the slope below the French horse artillery battery. Seeing only the French cavalry leaving the village, Wellington ordered the cavalry to attack. 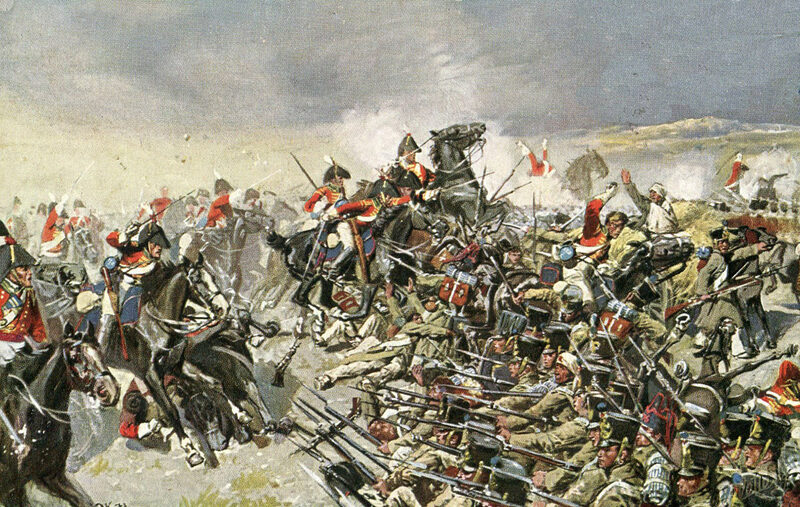 Anson’s Brigade, comprising the British 11th, 12th and 16th Light Dragoons, advancing from Garcia Fernandez across the bridge over the Gambo Brook, confronted the French 26th Chasseurs à Cheval and 3rd Hussars from Curto’s Light Cavalry Division to the right of the Valladolid road. 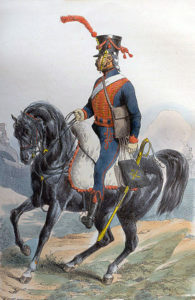 The British light dragoons drove back the left wing of the French cavalry. 2 French cavalry squadrons, not involved in the charge, moved along the high ground towards the French infantry formed in front of the guns. 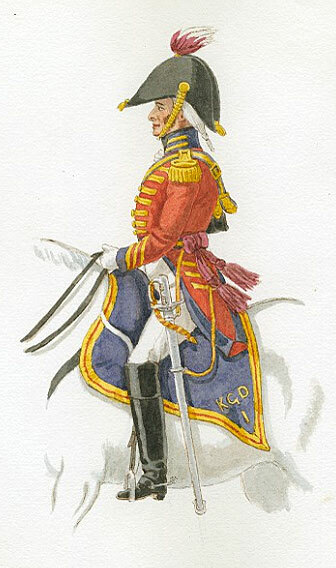 The leading KGL Dragoon squadron, the First Squadron of the 1st Dragoons, with General Bock at their head, emerged from the road and immediately charged the 2 French squadrons on the slope. The French cavalry declined the action and moved away, leaving the German squadron subject to a damaging fire from the French infantry and guns on the hill. The Third Squadron of the 1st Dragoons, coming up behind, found itself also subject to fire from the French infantry and guns on the hill. Wheeling to their left, the German dragoons attacked the nearest French infantry square, the 76th of the Line. 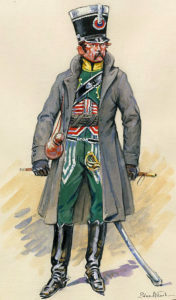 The German dragoon squadron received two volleys from the French infantry, before breaking into the square and virtually annihilating the battalion. The Second Squadron of the 1st Dragoons, emerging from the road, followed the Third Squadron in turning on the French infantry. Its target was the 6th Light, now in column and hurrying up the hill to gain a more advantageous position. The German dragoons immediately charged the French light infantry. Captain Philippe halted the two rear companies of the 6th Light and, facing about, fired a volley into the German dragoons, causing some casualties, before the German squadron enveloped the French regiment, killing, wounding or capturing many of them. The survivors from the various French infantry and cavalry regiments gathered at the top of the hill, where they were attacked by the Second KGL Dragoons, the other regiment of Bock’s Brigade and dispersed or captured. Further up the road, the rear-guard of Foy’s Division formed squares and brought their artillery into action, bringing the KGL rampage to a halt. Anson took over the chase of the retreating French army, until, on 25th July 1812, Wellington called a halt to the pursuit at Flores de Avila. Major General Baron Eberhardt Otto George von Bock travelled to England after the disbanding of the Hanoverian Army and formed the 1st Dragoons of the King’s German Legion. Promoted to major general, General Bock was an effective commander in battle, but his short sight limited his ability as a military commander. General Bock was drowned in 1814 when the transport he was sailing in was wrecked off the coast of France.